The PDF is a useful thing. If you have a copy of the editor software, Adobe Acrobat, you can do many useful things. I got hold of Sickenberger’s study of the catena of Nicetas a couple of days ago. Because I had Acrobat, I added a set of bookmarks for the bits I wanted. I translated them, as and where necessary. In the process I started to gain an overview of the work. I also OCR’d it, which gives me the means to use Google translate to work on the content. I also have Christophe Guignard’s French description, which helps a lot! The catena of Nicetas on Luke, as you remember, is a medieval commentary on the Gospel of Luke, composed entirely of chains (catenae) of quotations from the Fathers. It was probably written between 1100-1105, although Sickenberger thinks 1080 AD. A list of the manuscripts in which it may be found — for it has never been published — is something that I have long wanted to have. As someone more used to dealing with texts composed in antiquity, I find that it is quite strange to find an extant copy so close to the date of composition! 1) The oldest and most complete manuscript is the Vaticanus graecus 1611 (= V), written in 1116-7 AD. It is written on parchment, 38.5 x 30 cm, and contains 320 folios. The end is missing, however, as are two quires from the interior. But originally it contained the whole catena, and nothing else. The catena is divided into four books, and the date on which each was begun and completed is given in the colophon to each book, except, of course, for the last where the loss of the end portion includes the loss of its colophon. The copying was started on 11 June 1116 and book 3 was completed on 19 May 1117. The page layout is unusual, however. The text is laid out on each page in the shape of the Greek letter Π. At the top of each page, the text is given in 12 lines in a single column of full page width. But then it splits into two columns, initially of 28 lines each but increasing as the manuscript goes on to 29 from fol. 168, and then to 30 from fol. 201. The names of the authors of each extract are given in red ink. These are placed usually in the margin, but sometimes in the body of the text. Red ink is also often used for initials, and for text quoted from the gospel. The book hand is a cursive minuscule, probably all by one person. There are numerous abbreviations, some of which are expanded in the margins by a second hand of the same period. There are some corrections by the copyist himself, but in general the copy was made with great care. A more recent hand added an index on fol. 1v. Opinions vary as to the origin of the manuscript. There seems to be a link with the monastery of Rossano in southern Italy, founded in the 12th century AD, but it may have been brought there from Constantinople by the abbey’s founder, Bartholomew de Simeri. This is the manuscript used by Angelo Mai for his extracts of Eusebius and other authors in the 1820’s, and is undoubtedly the most important. 2) Paris Coislinianus 201 (C), paper, 15th century, contains the whole catena on 605 folios, 28.5 x 21.5 cms, each of 35 lines. The author names were written in red in the margin, but are now very pale. The division into books is not retained. The text is so clear that despite its recent date Sickenberger considered the manuscript more usable than any other for text critical purposes (presumably in the absence of an edition). This manuscript also contains the 57 extracts from Hesychius, and seems to be a descendant of the Iviron ms., judging from various features of the text. 3) Athos Iviron 371 (I) and manuscript 466 of the Metochion of the holy sepulchre of Constantinople, now in the National Library of Greek in Athens, are two halves of what was once one manuscript, parchment, 12-13th century, 24.5 x 19 cms. The Iviron ms contains 626 folios, but only the first 409 are original. Interestingly, after the division of this manuscript into two halves, in 1576 someone added paper quires to the back of the Iviron manuscript and copied the missing section there, probably from the Constantinople ms itself. Again author names appear in the margin in red ink in the original portion of the Iviron ms. But a distinguishing feature of this manuscript is that someone has added some 57 extra extracts under the lemma “of Jerusalem” which Sickenberger says come from a commentary by Hesychius of Jerusalem. The manuscript has been extensively corrected, apparently by the copyist. Parisinus graecus 208, paper, 14th century, 406 folios, 30 x 21.5 cms, which once belonged to Cardinal Mazarin, and also has the interpolations and alterations of the Iviron ms. However there are some differences from the Coislin ms., suggesting that it is a cousin of the Coislin ms, rather than an ancestor or descendant. The ms. is missing the start of the catena, and only contains the first part of it anyway. Author names are in the margin. Athos, Vatopedi 457, parchment, 13th century, 585 folios, 33.5 x 24.5 cms, each of 31 lines. 1) Vatican gr. 1642, parchment, 12th century, 295 folios, 36.5 x 28.5 cms, each page has two columns each of 30 lines. It is a copy of V.
2) Vindobonensis theol. gr. 71 (=L), 12-13th century, in Vienna, 424 folios, 30 x 19.5 cms, only contains book 1 of the catena. It does contain some lacunae, notably the first 9 folios. It is the work of two copyists, the second and more careful copyist beginning work at fol. 80. The first indicates the names of the authors in the margin; the second in the margin or in the body of the text. Initials are written in red ink. The manuscript was bought in Constantinople by Augerius of Busbecke, as a note on fol. 1 and f. 242v indicates, and is of oriental origin. It is in general very clear and readable, except for the first word or two of the first line of each page, where water seems to be responsible. 1) Angelicus gr. 100, from the Bibliotheca Angelica in Rome, parchment, 12th century, 32.5 x 22.5 cms, 343 folios. The beginning and ending are missing. 2) Florence, Mediceo-Laurenziana, Conventi Soppressi 176, parchment, 12-13th century, 314 folios, 33.5 x 24 cms. The manuscript is mentioned by Montfaucon in his Diarium Italicum (Paris, 1702), p. 362, lines 37-39. 3) Monacensis gr. 473, bombyzine, 14th century, 416 folios, 24.5 x 17 cms. Once belonged to the town library in Augsburg. 4) Casanat. 715 (formerly G II 9), paper, 16th century, very pretty manuscript. On folios 3-319 it contains book 2 of the catena of Nicetas. The incipit and explicit are the same as those in the Florence copy, indicating that this is a copy of it. Sickenberger considers that the tradition divides into three families. The Vienna ms., L, is the main and only complete representative of the second or Byzantine family, although Ang. 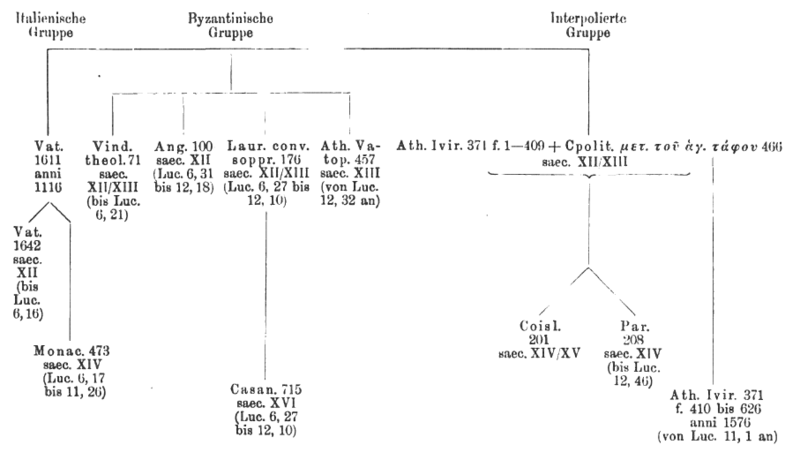 100 (12-13th c.), Florence Laurentianus conventi soppressi 176 (12-13th c.) and Athos Vatopedi 457 (13th c.) are cousins to it, rather than children. Casan. 715 (16th c.) is a copy of the Florence ms. Finally there is the “interpolated” family, where the Iviron ms. I plus the Metochion ms. is the best representative, from which C and Paris gr. 208 (14th c.) are descended, and of course the second part of I (fol. 410-626) copied from the Metochion ms.
Devreesse divided the mss. differently, however, but with much the same results. There are also secondary witnesses to the catena, because it was inevitable that so large a work would attract abridgement. The first of these abridgements is the catena published by Corderius. This is found in two mss. The first is the Venice Marcianus gr. 494 (13th century), which is very faulty. The authorship of extracts is often mistaken in this. The second is the Monacensis gr. 33 (16th century), which seems to be a copy of the former. Balthazar Cordier made a Latin translation of this catena, using a copy of the Venice ms., which he published at Anvers in 1628. In the 14th century, Macarius Chrysocephalus, metropolitan of Philadelphia, composed a catena on Luke, in which he made use of copious extracts from the earlier work of Nicetas. A manuscript may be found in Oxford, in the Bodleian, Barrocianus 156 (written in 1344). Guignard also mentions that an unpublished Latin translation exists of the whole catena of Nicetas, made from the Vatican manuscripts, and today at the Biblioteca Nazionale centrale (Rome), mss. 1742 and 1743, which was made at Sant’Andrea della Valle. I must confess that I wish I owned a copy of this! This is a great post, Roger! Thank you very much, Alin. But unlike your own invaluable work, it is purely derived from those like Sickenberger and Guignard who did the real work. But I felt that it was worth doing because no normal person has either author to hand, so there is merit in preparing an English-language summary. Who knows? It might spark someone to actually edit the text!